River Run is situated in the quaint college town of Davidson and features a superior championship golf course designed by Robert Walker and Ray Floyd. Amenities include a large tennis facility, (12 outdoor/four indoor courts), two swimming pools, fitness center, child care and a stately clubhouse overlooking the signature 18th hole. Charlotte's Best Magazine calls River Run, "a great golf course, tough enough to make you think, but fair enough to make playing a pleasure." River Run offers beautiful custom homes in a wooded environment. 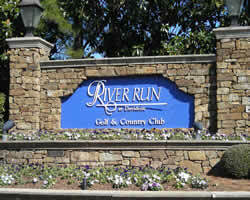 To view information about the River Run homeowners association, click here. Homes in River Run range from the $500s to over $1 Million. Looking for River Run homes for sale? Looking for River Run homes for sale? Search our local listings database for access to listings in River Run and surrounding communities. Whether you want to buy or sell River Run real estate, you can browse through properties or find a wide variety of real estate resources available on this website. If you are looking for a REALTOR® for River Run, choose Debbie Sloan. As your River Run real estate agent, Debbie Sloan can assist you with all of your home buying and selling needs. We can provide you with access to the Lake Norman local listings database and offer our experience and knowledge to make the home buying or selling process easier for you and your family. Contact Debbie Sloan today to get your home search started!